The automotive sector within the UK has become an increasingly important part of Telsonic UK’s business, as the company’s ultrasonic technology becomes the mainstay of many plastic-joining applications on a wide range of automotive parts and sub assemblies. In the company’s recent application, a twin head machine is used to weld inlet aperture mouldings into left and right hand blow moulded ducts for MGS Technical Plastics Ltd. The HDPE (high density polyethylene) blow moulded ducts have PP (polypropylene) injection moulded apertures at each end of the part. These apertures are designed to engage with a nominal clip fit to produce an initial, loosely held sub-assembly. A supporting twin spot weld, on one side of the large aperture end of the assembly, is also required to maintain the integrity of this sub-assembly until the parts are finally assembled into the vehicle. The ultrasonic process offers a fast, consistent and repeatable process, capable of penetrating these thick walled parts. Other, mechanical fix methods such as staples were ruled out as being unsuitable. The process also fits the recyclability requirement of the parts as no further fixing methods or materials are used. The materials are dissimilar, preventing a true fusion weld, however a spot-weld through the HDPE into the PP moulding at two strategic points creates a mechanical locking action of sufficient strength to retain the assembly until it is finally presented to the vehicle on the production line. 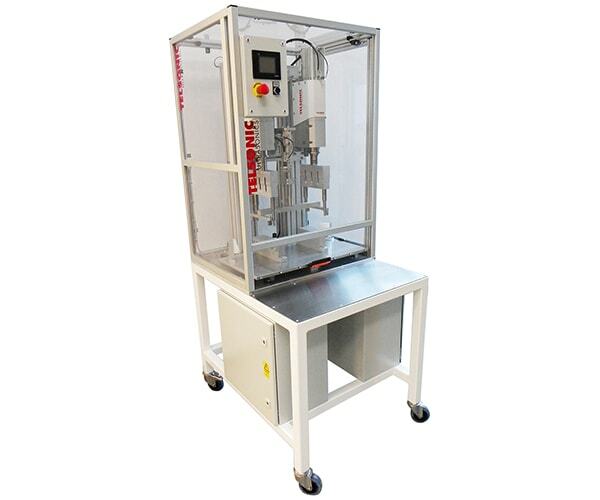 The machine, built by Telsonic UK, is a free standing, fully guarded compact design incorporating dual Telsonic AC1900 actuators. Each of these units has Titanium Mother / Daughter twin tipped staking horns, powered by a switched MAG2024 2.4kW 20kHz generator system. The operator interface is via a touchscreen, which offers weld setting recipes, weld limits and manual set up menus. The component nests have 3D CAD cut location features, accommodating a pair of left and right hand parts in each cycle. These in turn are mounted on a sliding table that is fully interlocked with an auto start and power out facility. Actuator driven integral clamping arms ensure repeatable location and tight closure of the parts, important aspects of the spot welding process. Telsonic UK were selected as the supplier due to their extensive application experience within the automotive sector, and their ability to support MGS Technical Plastics Ltd at all stages of the project. This included the in-house sub-contract manufacture of pre-production assemblies whilst the production machine was being built. Telsonic UK offer a comprehensive range of ultrasonic modules and systems for a variety of metal and plastic welding, sealing, food cutting, textile cutting and cleaning applications.